Standing Sushi Bar has established a good reputation for good quality Japanese cuisine since opening back in 2009. 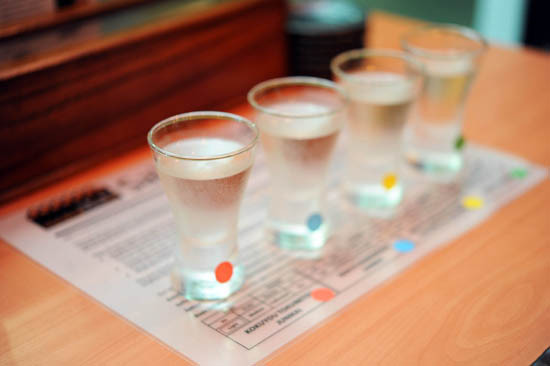 The quirky concept of standing-in-a-sushi-bar has also helped boost their popularity in the Singapore Food Scene. Fans of Standing Sushi Bar will be happy to know that they have recently added new branches at 8Q Singapore Art Museum and Marina Bay Link. The new location at 8Q sam is much bigger than their original outlet at Raffles Place. While I like the idea of watching the chef in action while eating at a sushi bar, sometimes I just want to sit in a corner and enjoy my Japanese food in peace. Standing Sushi Bar’s menu is very comprehensive and it includes a good variety of sashimi and sushi, agemono, robatayaki, noodle and grilled items. It took us a while before we could decide on what to order. Luckily, the staff was very knowledgeable about the menu and she advised us to go for some of their popular dishes. The Sushi Take ($25) set came with 7 assorted nigiri, 2 pieces of maki, miso soup and a salad. Every piece of nigiri was so delicate and easy on the palate. The Garlic Fried Rice ($7) came highly recommended and it did not disappoint. It had a lovely smell and every grain was so good. Seriously I could just eat this and ignore everything else. Definitely one of the best fried rice I’ve had. Standing Sushi Bar’s Sashimi Platter ($35 for 6 kinds, 12 slices) is a good choice if you want variety. But we decided to focus solely on Salmon Sashimi ($10 for 5 slices). There are only so many words you can use to describe sashimi, and sooner or later, it is inevitable to repeat the same description. So here goes: the gorgeous salmon sashimi was extremely fresh, and it was excellent with a gentle touch of wasabi. With choices like foie gras, chicken heart, chicken gizzard, chicken skin, chicken cartillage on Standing Sushi Bar’s robatayaki menu, it was very difficult to choose just one. In the end, we went for the Beef & Enoki mushroom skewer ($8 for 2 sticks) and it was fantastic! Together with the flavourful sauce, the mushrooms added an earthy tone to the succulent and tender beef. Anyway, I am not sure if it is just me, but I do feel that most Japanese restaurants in Singapore have pretty expensive grilled skewers. Do let me know if you know any place that serves cheap and good yakitori. We were quite full by now, but of course, there’s always room for desserts and we ended the Japanese dinner with matcha and black sesame ice cream. The fact that there are plenty of seats in a Standing Sushi Bar (SSB) is contradicting, but I am not complaining. The new Standing Sushi Bar at 8Q @ Singapore Arts Museum (SAM) is a place where you can dine in peace and have good Japanese food. Otherwise, there is always Food For Thought Cafe, which serves comfort food at affordable prices. With sashimi, sushi and sake, my life is complete. 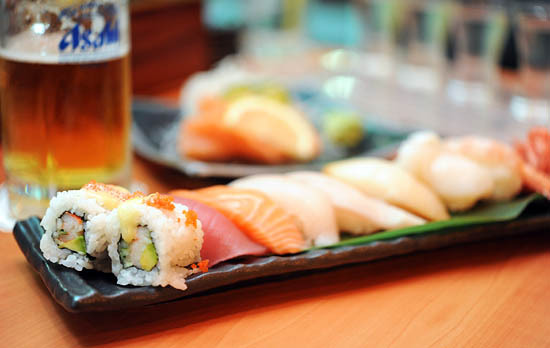 // Standing Sushi Bar at 8QSAM has an 1 for 1 Asahi draft beer promotion from Monday to Friday 5pm – 7pm happy hour. Minoriya along Tanjong Katong Rd have a Ala-carte buffet. their Yakimono menu are nice. you didnt eat the scallop salad? (not on the menu) it’s the best! Is this place really awesome, worth one of our nights in singapore?